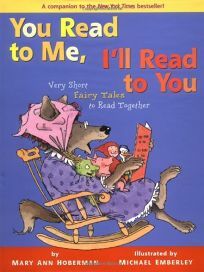 Conflict resolution seems the theme of You Read to Me, I'll Read to You: Very Short Fairy Tales to Read Together by Mary Ann Hoberman, illus. by Michael Emberley. As with this duo's first collaboration, the tales take the form of a conversation between a pair of characters (such as the princess and the pea or Jack and the ogre atop the beanstalk), allowing the stories to be read aloud by two people. As the characters quibble over plot points, they ultimately come to terms, in each case deciding, ""You'll read to me!/ I'll read to you!""